The Federal Reserve needs to get out of the business of bailouts but government has a responsibility to act and defend the public interest, Sen. John McCain said Friday as he outlined his plan for stopping the floundering economy and crisis on Wall Street. The Republican presidential nominee, in comments to the Green Bay Chamber of Commerce, said he hoped Congress would act soon and accused Democrat Barack Obama as being a Washington insider incapable of solving the problem. McCain has been in Congress for 26 years; Obama has served for almost four years. McCain also said the Fed should get back to "its core business of responsibly managing our money supply and inflation" and he laid out several recommendations for stabilizing markets in the financial crisis that has rocked Wall Street and commanded the dialogue in the presidential campaign. In an interview with CBS Minutes correspondent Scott Pelley to be aired on Sunday, McCain was asked if he thinks the country is in a recession. "Sure. 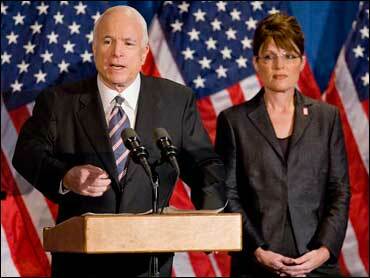 [but] technically, I don't know…Americans today don't care about what the, quote, 'technical term' is," McCain said. "Unemployment is up. Wages are down. Home foreclosures are incredibly high, the worst in many, many, many years. All of the indicators that affect the American family, unemployment being up - those people, they don't care whether technically we're in a recession or not. Fact is they're hurting and they are hurting very, very badly." In a separate interview with 60 Minutes, Obama also agreed the country is in a recession. Watch interviews of McCain and Obama during a special edition of 60 Minutes, this Sunday at 7 p.m. ET/PT. The Fed engineered an $85 billion takeover of insurance giant AIG this week after seizing control of housing giants Freddie Mac and Fannie Mae. McCain said that to help return the U.S. to fiscal solvency, the powerful central bank should instead focus on shoring up the dollar and keeping inflation low. "A strong dollar will reduce energy and food prices," McCain said to applause from the Green Bay Chamber of Commerce. "It will stimulate sustainable economic growth and get this economy moving again." The Arizona senator again criticized Obama for ties to Freddie Mac and Fannie Mae and for advocating tax increases McCain said would "turn a recession into a depression." Obama has said he would raise taxes on people making over $250,000 a year and would cut taxes on the middle class. McCain restated his claim that Obama had voted to raise taxes on people who make just $42,000 a year - a claim that has been widely debunked by nonpartisan fact check organizations. McCain noted the Illinois senator had taken large campaign contributions from both Fannie Mae and Freddie Mac and that the one-time head of Obama's vice presidential search team, Jim Johnson, had received a multimillion-dollar severance deal after stepping down as Fannie Mae CEO. "Maybe just this once he could spare us the lectures, and admit to his own poor judgment in contributing to these problems," McCain said of Obama. McCain's campaign also released a new television ad Friday hitting Obama for his connection to Johnson. The Arizona senator is correct when he says Obama is the No. 2 recipient of campaign money from employees of Fannie Mae and Freddie Mac. Obama has collected $126,349 from those sources, according to a compilation by the Center for Responsive Politics, second only to Senate Banking Committee Chairman Sen. Christopher Dodd, D-Conn., who has received $165,400. The ranking covers the period since 1989. Obama on Friday said he backs giving "broad authority" to the Treasury Department to deal with the burgeoning credit crisis, but said he's not spelling out details of his own plans to avoid roiling the markets. He said any recovery plan should be guided by not rewarding reckless business leaders. "What we have to do is make sure taxpayer money is not being used to bail out bad decisions," he said. He refused to put a pricetag on a bailout he could support, but said it would not bar him from pushing for middle-class tax cuts that have been central to his campaign. "I think now more than ever we have to have the broad-based middle-class tax cuts," Obama said. The plan McCain outlined also calls for creation of an early intervention system he called the Mortgage and Financial Institutions trust to help companies avoid bankruptcy, and keep people in their homes and protect their savings. McCain called for enhanced regulatory clarity and proposed reforms to prevent financial firms from concealing their "bad practices." McCain has a long history of opposing government regulation and he has served on and been chairman of the Senate Commerce Committee, which has regulated - and deregulated - vast parts of the economy. McCain said there is a confusing mix of regulatory agencies that were either lax in carrying out their responsibilities or at worst were guarding their "bureaucratic turf." "We don't need a dozen federal agencies doing the job badly, we need the best federal agencies to do the job right," he said. He also called Securities and Exchange Commission Chris Cox a "good man" but reiterated his view that Cox should step down or be fired, saying there needed to be greater accountability in Washington. Alaska Gov. Sarah Palin, who introduced McCain, said "elements of a perfect storm" could come together "that will not be good for the future of America." She said those elements were high taxes, high gas prices and a dependence on foreign oil, too little courage in Washington and too much greed on Wall Street. McCain blamed Obama for not taking action to stop the current financial crisis. "The crisis on Wall Street started in the Washington culture of lobbying and influence peddling, and he was square in the middle of it," McCain said of Obama. Throughout the week, McCain and Obama have tangled over which candidate is better to steer the U.S. out of its financial crisis. One investment giant, Lehman Brothers, collapsed this week and another, Merrill Lynch, was purchased by rival Bank of America for less than half its value.